We hope that everyone had a wonderful holiday season filled with family, friends and good food. We enjoyed having a quieter week around here, but don’t fear, we will be back at the Town & Country market tomorrow morning with everything to help you get a healthy start to the new year! Jason and Claudio from Noble Bread will be with us at both markets this week with a large selection of Grain & Legume, Country, and 9-Grain breads for you. We are back on our normal market schedule from here on and look forward to seeing you at Town & Country tomorrow or Old Town Scottsdale on Saturday. Also, for more beautiful photos from the farm like the one above, follow Sean on Instagram at instagram.com/seanmcclendon. 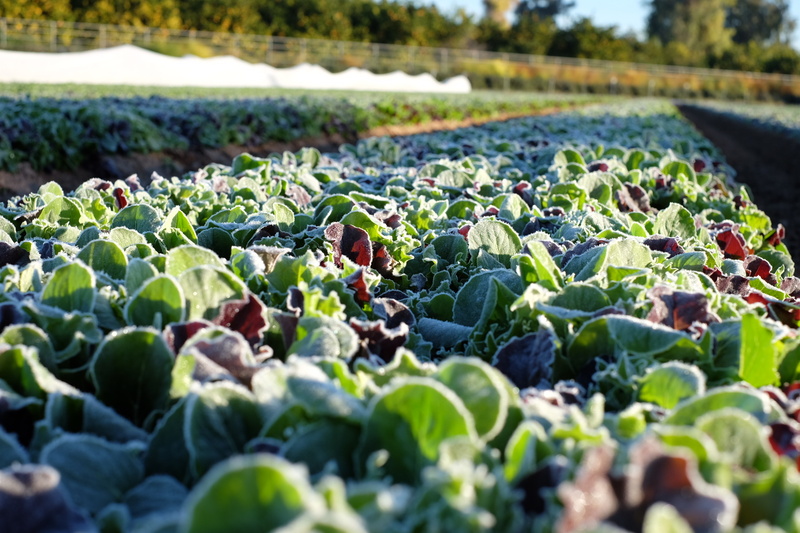 He took that photo yesterday while waiting for the frost to thaw before cutting the baby lettuce mix. Sometimes the farm makes us stop and appreciate the moment before moving on.